I was beyond excited to finally arrive in Zermatt, Switzerland for a few reasons: #1 – to see the famous Matterhorn, #2 – to touch the snow for the first time, #3 – you don’t need any more reasons. The most memorable part? My first Matterhorn viewing. The area has only 6,000 locals but come winter and summer peak times, this place lights up with tourists to bask in wintery mix and fresh mountain air. What surprised me the most about this slice of paradise was that it’s a car-free city. The only “cars” allowed are small electric buggies used by hotels for transport purposes. They have done this to prevent air pollution, which could obscure the view of the Matterhorn. Zermatt is the closest town to the Matterhorn and is used by just about everyone visiting Matterhorn as a starting point. However, there are no cars permitted in Zermatt. So, we drove to Tasch, stayed overnight and parked at our hotel in Tasch. 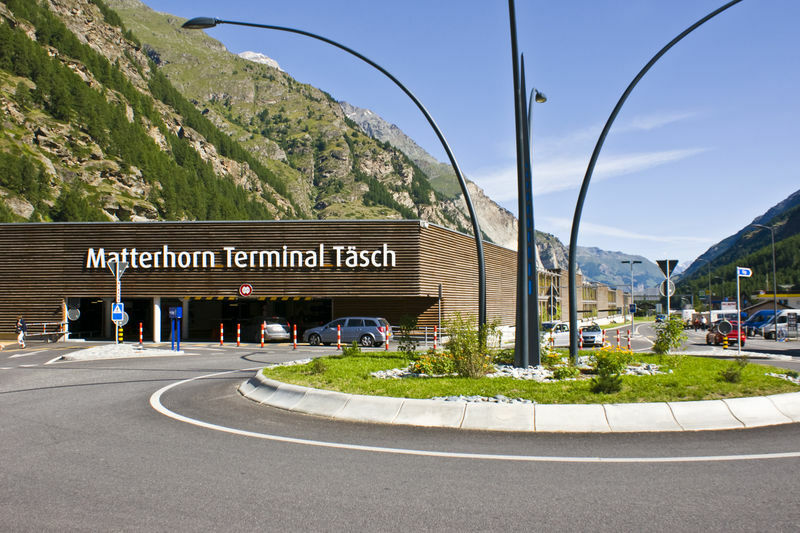 If you are going to stay in Zermatt, you can park your car at a special station called Matterhorn Terminal Tasch. When we arrived at the station, we didn’t see the typical Swiss train ticket machine, but there is a ticket counter staffed by people who speak English. We purchased our tickets and headed to the platform for the train to Zermatt. The Tasch train station had a specific “shuttle” train that only runs from Tasch to Zermatt and back, and the journey is very quick, only 12 minutes. The train arrived in Zermatt around 9:10am and we only had to walk across the street to the Gornegrat Bahn train station to get our tickets and hop on the train. Gornergrat Bahn is the highest open-air railway in Europe. After boarding, we were really glad we chose to take the train. It is very comfortable and had huge windows so you could really enjoy the scenery on the trip up the mountain. We snagged seats on the right side of the train, we had such a spectacular view of the Matterhorn on our right side! The most fun part, we were able to see the Matterhorn for most of our journey up the mountain. We found ourselves compulsively snapping photos all the way up, as the extraordinary shape of the Matterhorn loomed closer and closer. But the best view, of course, is at the very top. There were several stops along the way between Zermatt and Gornergrat and a lot of people got on and off the train along the way because there are a ton of beautiful hiking trails on the mountain. There were also few restaurants and hotels at the stops. After about 30 minutes, we arrived at Gornergrat and disembarked. The view at Gornergrat was absolutely stunning! Not only we could see the Matterhorn, but we could also see several mountains and glaciers surrounding it. Considering Gornergrat is well over 3,089 meters, there were several different viewpoints at Gornergrat. Where we could see spectacular sight of not only the iconic Matterhorn, but the panoramic views of almost 30 Alpine peaks surrounding it. We spent about half day at Gornergrat and another two hours at Rotenboden, one station below Gornergrat before catching the train to head back to Zermatt. We were really lucky that we had such a clear view of the Matterhorn. I think the trick was that we arrived in the morning before the clouds moved in. We were also lucky that while there were plenty of people in Zermatt, it wasn’t too crowded. Try to make the earliest train to Gornergrat. The sky tends to be beautiful and clear in the morning with more chance of fog in the afternoon. Sit on the right side on the way up the mountain, to enjoy the best views of the Matterhorn and down to the valleys. Wear warm clothes and sturdy shoes! While I wore Sketcher’s sport shoe because that’s all I had with me, I would recommend any shoes with good traction such as hiking shoes because there was a bit of walking on dirt and the ice is slippery. In case you need to stay connected with the world, there is a free internet in the Zermatt tourist office right next to the central station. If that fails, buy hot chocolate from McDonalds and use the Wifi there. If you are a flexible traveler and there’s no strict schedule to follow, it is not necessary to buy the tickets online in advance. We bought all the tickets at the counter. As much as admire the Matterhorn natural landscape, i can feel how challenging it is to climb the mountain. The challenge of the Matterhorn is not so much the climb up, but rather the descent. Over 500 people have died climbing or descending the mountain making it one of the deadliest peaks in the world. That’s double the number who have died on Everest. Matterhorn’s first accent were by Englishman. It was a dramatic affair as four other members of the roped team were killed on the descent when one slipped and pulled other three with him down. The three survivors were later accused of having cut the rope below to ensure that they were not dragged down with the others, and it’s a mystery that’s still talked about today. By car: Drive to Täsch, then take a short train ride to Zermatt. In Täsch, park your car at Matterhorn Terminal Täsch located next to the train station. The parking rate is about 16 CHF per day. Alternatively, park your car if you are staying in any Täsch hotel. Buy return train tickets to Zermatt, about 16.40 CHF/adult, 8.20 CHF/child and children under 6 free. By transit: Simply ride the train directly to Zermatt. You don’t need to change train in Täsch. By train: Buy return train tickets to Gornergrat from Zermatt, at the Gornergrat Bahn station. It is 90 CHF/adult, 45 CHF/child and children under 6 free. You can always refer to Zermatt Matterhorn Official Website and Gornergrat Bahn Official Website for the price updates. I had an amazing experience at the Matterhorn and highly recommend planning a visit while traveling in Switzerland! Switzerland wasn’t only in my bucket list for travelling but also I’ve been dreaming to attend Auckland University for my master. Ahah. Oh damn, I was confuse, Auckland wasn’t in Switzerland it’s in NZ. Ahaha, pardon my mistake. Hi Fatin. Thank you for writing this very lovely & helpful entry. May I know, where do you base at for the trip to Zermatt? Do you stay overnight at Matterhorn? We are planning to go there on May-June next year. I was staying in Tasch. You can either stay in Tasch or Zermatt. Matterhorn’s hotels are super expensive. But, if you are staying in Tasch, you need to pay for return train ticket to Zermatt town. We have overlooked this part 🙁 Cost-wise, more or less it is about the same either you are staying in Tasch or Zermatt. If more people going I recommend to stay in Zermatt instead of paying return train ticket from Tasch-Zermatt. Toblerone chocolate was inspired by the triangular shape of the Matterhorn’s distinctive profile – ini sy baru tahu..
saya memang tak gemar ke tempat-tempat sejuk-sejuk ni…switzerland masa tak sejuk cantikkan? p/s: ada ke tayangan filem hindustan Dear Zindagi kat Switzerland nih?? All the pictures are so pretty! And never knew that Toblerone is based on the mountain shape. cantik tempat ni…enta bila dpt prg kan..
oooo kat sini rupanya Coklat Toblerone mendapat inspirasi.. Memang cantik sgt! Thanks for the tips. What a cool connection to the chocolate – I didn’t realise – interesting fact. Bestyaaa Fatin dapat merasa ke Swiss . My wishlist country to go . Nnt boleh buat as reference blog Fatin . Beautiful snowy mountains. Such a wonderful holiday! Very well written piece of information on Matterhorn. The views are phenomenal. I have visited Switzerland 20 over years ago in the month of September, the landscapes are beautiful, I really love to see the flowers planted in front of their windows. Wow bestnya travel..kak lina suka jugak travel..tp dah lama x ke mana2..kekangan ms dan duit hahaa..paling jauh pun beijing ajer..
Masya Allah.. cantiknya pemandangan.. putih bersih mesti udara pun segar..
Fatin, naik ke keretapi yang lalu bukit bukau tue apa ye namanha Nadia lupa . Masa plan nak gie sana buat research pasal keretapi tue tapi dah tak ingat nama nya. Hi Nadia. Banyak train kat Europe & kat Swiss ni. X tau yg Nadia tanye ni which one. Maybe Glacier Express? owh, baru tau toblerone punya choc logo ada wujud, kikiki..
Swiss nie semua tempat2 dia cantik sangat kan..
macam best aje kalau pegi nih. Suka tengok keindahan New Zealand. Bila entah dapat jejak kaki kat sini. Cantiknya pemandangan, first time singgah blog ini! Teruja gila..
Baru sampai NZ… okay lh cantik juga … subhanallah. Ooo itu asal usul tobleron. Gigih bawah tobleron utk bergambar. Tp sib baik lh cuaca okay. Sy dh buat iti swiss ni sikit2. Bnyk review yg sy dapat … sian kengkawan sy … g je hujan. Awesome tips and insights! Didn’t know the linkage between Toblerone chocolate & Matterhorn earlier. Now I’ll think of the place when eating my fave chocolate! bestnye dah sampai switzerland.. cantik gile tmpt tu..
Bestnye dapat berjalan kat negara orang.. Cantik sangat pemandangan..
Jaw dropping view of swiss! thank you for the tips. saya pun akan ke swiss hujung bulan ni tapi x pi tempat ni sbb dah buat iti awal2 area bernese oberland. matterhorn ni cantik rupanya. saya teringat jenama kasut matterhorn yang diguna oleh askar kita. memang sturdy. tak terfikir pula rupanya jenama tu adalah daripada nama matterhorn di swiss. Hai Fatin, cantik sungguh gambar2 dari lensa kamera Fatin. Subhanallah….cantiknya Fatin. Bersih, putih, redup mata memandang. So gorgeous! i really miss Switzerland, and I miss snow… And I miss the cold! haha! Great pics! cantiknya gambar! Suka lah tengok..ni yang nak masuk dalam list ni..
btw, oh…baru tau toblerone diinspirasi dari situ..tq info. Wooowww Subhanallah cantiknya.. Thanx for sharing.. Aiyaaa rindu Switzerland..
wooahhh. such a beauty. cantikknyaaa. subhanaAllah.